The innovative Dyson V7 and V8 aren’t your standard cord-less vacuums as many people would expect when their name is mentioned. Many people might think that a cordless vacuum is just an average vacuum with average power and short runtime. Contrary to the expectations of many, Dyson has utilized modern technology to design cordless vacuums that are not only portable but also incredibly powerful. According to a case study published by Siemens, Dyson has utilized cutting-edge technology to produce the most efficient cordless vacuums. But between V7 and V8, which is greater? It can be a daunting task to know which machine among the two is better and that’s precisely why we prepared the Dyson v7 Vs v8 review for 2019. Just continue reading on to discover more. Dyson v7 Vs v8, which one should you purchase? Well, these models are designed very similarly, but the V7 Animal is going to be a better value for carpeted floors, whereas the V8 Absolute comes with a soft roller head that is designed to clean hardwood floors. Before I dig dipper into the Dyson vacuum comparison, I’d like to say that Dyson V7 proved to be the clear winner after our head-to-head comparison. The cordless vacuum cleaner boasts most of the impressive features found in Dyson V8, but it comes at an incredibly lower price. It is also less noisy compared to V8. Though it comes with slightly less cleaning power, the small difference in the power can’t beat the advantage of a lower price and less noise, to mention a few. And if you have pets, the v7 Animal is going to be more along the lines of what you are looking for to keep your home clean. The Dyson V7 Animal is a cordless, stick vacuum that is quite powerful. It is designed to work well in homes with pets, so it was built with 75 percent more brush power so that the nylon bristles can easily reach into the fibers of the carpet to give it a deeper clean. As the title suggests, Dyson v7 was designed to improve the v6 vacuum without digging deeper into the pocket as one would with the V8. It comes with many similar features to those of the flagship v8 but at a more affordable price. It is also designed in a similar way to the V8. 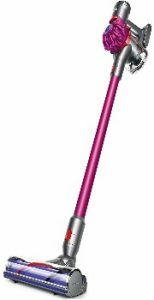 Dyson V7 can be used as both upright/stick vacuum cleaner and handheld cordless cleaner. It includes enhanced lithium-ion battery that delivers fade-free power in as much as 30 minutes in minimum power mode and up to 6 minutes in maximum power mode. Since this is a stick vacuum, it is lightweight and easy to maneuver. This means that you can easily reach the hard to reach corners of your home, and you can even turn the vacuum into a handheld unit if you need more portability. 30 minutes fade-free power is sufficient to clean a large area thoroughly. It doesn’t produce much noise and is more svelte compared to the Dyson V8. This unit is designed to run for 30 minutes before it needs to be recharged, which should be more than adequate for most homes. It will take about 3.5 hours to replenish the battery fully. With pet-hair cleaning capabilities, super suction, authentic looks, brilliantly balanced, and light, V7 is one of the best of Dyson’s models. Versatile and lightweight for hassle-free home cleaning. Delivers as much as 30 minutes of fade-free cleaning power in the minimum power mode. Offers up to six minutes of fade-free power in maximum power mode. Engineered to pick up fine dust and ground-in dirt from carpets and hard floors. Comes with hands-free hygienic bin emptying. Easily transforms into a handheld cordless vacuum to conveniently clean all around car and home. Comes with less power compared to v8. Runs for a shorter time compared to v8. There is not a low battery indicator. You must hold the power button in place to keep it on. The Dyson V7 is an excellent option for anyone who is looking for a powerful vacuum at a great price. It is a high-quality option, especially if you have pets and carpeted floors. Needless saying; Dyson v7 provides excellent value for money. I would say that this is one of the best Dyson vacuums available because the device comes with as great features as those of v8 but with a lower price. 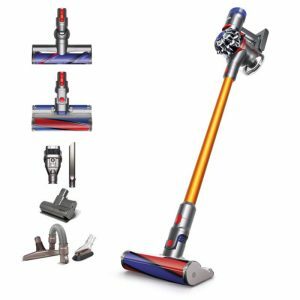 Dyson v8 cordless cleaner follows a similar design idea of the v7. 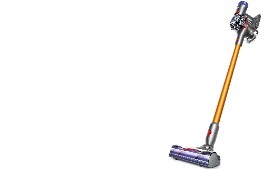 You can use the vacuum as a cordless upright/stick cleaner or as a handheld cordless cleaner. The Dyson V8 is designed with 150 percent more brush power than the V6, so it can easily get all of the dust, debris, and pet dander from your carpets. The vacuum is designed with a HEPA filter, which can keep homes with pets free from dander and other allergens. The filter is designed to last a lifetime, so it should be cleaned on occasion. The vacuum cleaner comes with a high capacity lithium ion battery which is able to deliver 40 minutes of fade-free power in minimum power mode. The cleaner provides 7 minutes of fade-free power while in the maximum power mode. V8 is slightly heavier than Dyson v7 but relatively lightweight and easy to carry around. This vacuum cleaner is also charged and stored in docking station waiting to be put to use any time you need to. I find that this is plenty of time for my small apartment, but if you need to recharge the battery, it will require an additional four hours of charging time before you can vacuum again. The unit comes with a dirt bin capacity of 0.5 liters, which is sufficient for a majority of home cleaning tasks. Considering 40 minutes of operation on one charge, the price, and features, the dirt bin could have been larger. Its dustbin is transparent and a breeze when it comes to emptying it. Cord-free meaning hassle free during use. Comes with a powerful suction. Delivers as much as 40 minutes of fade-free cleaning power in the minimum power mode. Provides up to eight minutes of fade-free power in maximum power mode. It comes with whole-machine HEPA filtration that traps allergens expelling cleaner air. More expensive than Dyson v7. Considering the price, features, and runtime, this Dyson cordless vacuum would have come with a larger dust bin. The dust bin is small. It only runs for eight minutes at maximum suction. The Dyson V8 is an option that has a bit more suction and a longer runtime, so if you have a larger home, this may be the vacuum that you are looking for, especially if you have pets. If you want to maximize your cleaning power and you don’t worry about a higher budget and more noise, then Dyson V8 is the one that comes with slightly higher cleaning power. You’ll also enjoy a longer run time compared to v7. Are looking for higher value for money- This model comes with great features, design, and accessories at a price lower than that of v8. Less noise- v7 produces 10Db less noise compared to v8. Dyson v7 is available in several models which include Dyson v7 absolute, Animal HEPA, Car+Boat, Trigger, and Dyson v7 motorhead. Dyson V7 comes with a built-in battery which charges in as little as 3.5 hours, either kept in its great wall dock or freestanding connected directly to a wall charger. The battery is light but non-removable. This means that you can’t grab a spare battery to extend the cleaning session. Its two motorized floorheads get their power from the battery with cables neatly hidden in the major tube and power plugs made into the tool connectors. The battery comes with a LED indicator, which is orange when the battery is dry, goes off when the device is fully charged and turns blue while charging. The V7 delivers a suction power of a whopping 100AW (air watts) while the Dyson V8 boasts 115AW which is 15% more than that of V7. This is not to say that V7 is weak..duh. V7 comes with an ultra-powerful direct-drive floor head which is 75 percent more powerful than the previous V6 version. How noisy is Dyson V7? Right from the very first pull of its trigger, the V7 vacuum is incredibly more silent than the Dyson V8. Its pitch tone is remarkably less aggressive and much softer than the V8. V7 produces a reasonable 61-62Db noise in regular power mode measured from the arm’s length and 64-66Db on maximum power. On the other side of the coin, I suspect the noise reduction is achieved by avoiding the inclusion of the rear post-motor filter seen in V8. This is compensated on the V7 by use of foam baffle to lower noise. The foam baffle also does a great job in air purification, but ideally, it may not beat the efficiency of a post-motor filter. Its dirt bin is transparent, and this enables the user to monitor the amount and type of vacuumed dirt conveniently. Similar to Dyson V8, air purification is achieved through mechanical filtration and strong cyclonic action. Dyson v7 Motorhead comes with a crevice tool and a combination tool. Other models come with a mini motorized tool and combination tool. V7 have a docking station for storing accessories and charging. Longer run time-V8 runs 10 minutes longer than v7 while in the normal power mode. 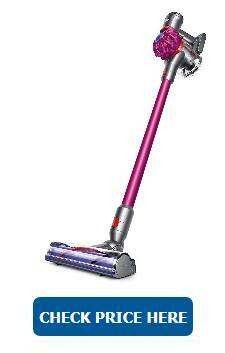 Dyson V8 cordless vacuum comes in two main models which include Dyson v8 absolute and v8 animal. V8 comes with a similar battery to that of v7, but v8 delivers a longer run time. The lithium-ion battery of the v8 has a comparably larger power capacity of 2,800 mAh. One of the major differences between Dyson V8 and V7 is the motor. V8 comes with the most powerful v8 engine making it able to get rid off more dirt and dust particularly when in boost mode. It also comes with an ultra-powerful direct drive cleaning head that cleans deeper into your carpets. How noisy is Dyson V8? The V8 produces 75dB levels of noise on maximum power. Because decibels are determined on a logarithmic scale, the difference of 10Db is remarkably huge. Both the v8 and v7 comes with similar accessories. V8 also comes with a crevice tool and a combination tool. Some v8 versions have a mini motorized tool and soft-dusting brush. However, the kit you acquire depends on the vacuum version. DYSON V8 also has a docking station for storing accessories and charging. If you are in a rush and probably didn’t grasp all the above, the following quick table is made for you. Just check it out. Dyson V7 comes with many similar features to those of the flagship v8 but at a more affordable price. It also comes with a design identical to that of V8. Though Dyson V8 has a slightly higher suction power, this doesn't mean that V7 is a weaker vacuum cleaner. During our tests, we found that the results after cleaning with the two devices are similar. V7 produces 61-62Db noise in regular power mode and 64-66Db on maximum power. V8 delivers 75dB levels of noise on maximum power. Since decibels are determined on a logarithmic scale, the difference of 10dB is enormous. V7 delivers fade-free power in 30 minutes in minimum power mode and up to 6 minutes in maximum power mode. On the other hand, Dyson V8 provides 40 minutes of fade-free power in minimum power mode and 7 minutes of fade-free power in the maximum power mode. Both the v8 and v7 comes with similar accessories such as crevice tool, combination tool, mini motorized tool and soft-dusting brush. However, the tool package you get is determined with the version you buy. In general, Dyson filter is simple to clean. Before you begin, you will want to remove the charger and ensure that the vacuum is in the off position. Twist the filter to remove it, then run cold water through the filter to rinse off the dust and debris. Gently tap the filter on the side of the sink to remove anything that was not rinsed clean, and then repeat the steps until the filter is clean. Never put the filter back in the vacuum wet. It is a good idea to allow it to dry for at least 24 hours before replacing the filter. Dyson has a step-by-step walkthrough of the cleaning process. So between these two, which one should you buy? I would strongly recommend that you go for v7 for a good reason. The cleaner comes packed with all the great features you would look for in a cordless vacuum cleaner but at a lower price. 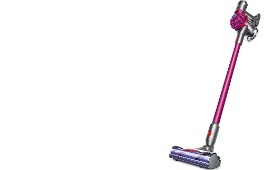 As I wrap up, I can’t emphasize more that Dyson V7 beats Dyson V8 after a sneck-to-neck face-off. Our winning cordless vacuum cleaner boasts impressive features such as less noise, considerable run time, good suction power, compact and lightweight, as well as great accessories. The most exciting part is that all these features come at a considerably lower price. Though v8 comes with slightly higher cleaning power, it proved to be not only more expensive but also noisier. That’s why v8 is not a favorite among many buyers especially those who don’t want to drive their budget through the roof and keep up with more noise when cleaning.